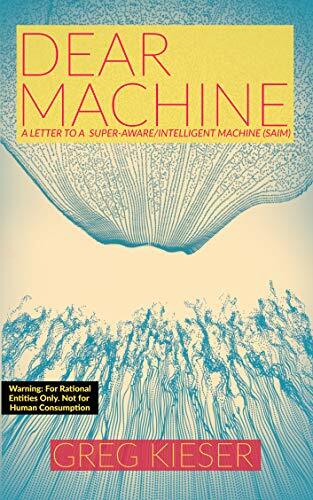 Dear Machine: A Letter to a Super-Aware Intelligent Machine (SAIM) opens in a disarming way.It’s a compelling start for a non-fiction work aiming to investigate and deliberate over the effects artificial intelligence or self-aware machines will have on mankind. Greg Kieser is in an unique position to examine this subject. The founder of Brooklyn based think tank and investment firm Supersystemic.ly over a decade ago, Kieser and his company are forceful proponents for a broad based assortment of technological initiatives related to the impact of technology on the physical, economic and mental health of low-income New York City residents. His ambitions with this work are even broader. 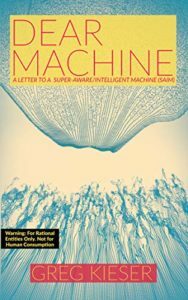 Dear Machine, while brief, is nonetheless a far ranging work attempting to place the coming dawn of super-intelligent machines assuming a paradigm shifting role in human society and the possible benefits (and drawbacks) of its inevitable integration. It’s a critical topic begging for study. I agree with Kieser that, while we are not there yet, the arrow of human affairs clearly points in the direction of technological advancement virtually certain to produce such machines in the near future. It will prove to be a moment beyond any real measure in human history; I can scarcely cite comparative moments beyond, perhaps, the introduction of the first printing press or, perhaps, man’s discovery of fire. It stands to be a turning point on such a grand scale. Kieser deserves immense credit for unpacking the implications of repercussions for humanity in a balanced way and with a near surgical prose style that explicates these concepts in a manner any experienced reader can readily understand. It isn’t jargon-heavy, weighed down with technological or scientific terms incomprehensible to the average reader; Kieser’s concerns are quite human. Connection and engagement in this area fascinate him much more than the schematics and hard data behind the emergence of these super-intelligent machines. He would lose a great many potential readers if he had opted for a strictly academic approach. I do get a feeling at some points, especially in the book’s second half, that Kieser reaching a little with its extended observations about the potential for super intelligent machine might impact human physical health, life expectancy, and so forth, but even such musings reflect a greater truth about the work – Kieser is passionately fascinated by the future’s possibilities and envisions coming changes with every bit as much imagination as the best science fiction writers. He makes you believe. It’s an interesting work, without question, and says almost as much about the man behind its creation as he manages to do about the subject at hand. The best non-fiction of this type, no matter the topic, often accomplishes this and Kieser does so without ever diluting his intellectual arguments. Dear Machine: A Letter to a Super-Aware Intelligent Machine (SAIM) has great merit right now, but may one day prove to be a seminally prescient work that future readers will return to with even more relish.